With the Plurk app, you can view your timeline, read and respond to plurks, send and receive public or private plurks, and view profiles. You can add emoticons to your plurks as well thanks to the emoticon hints. 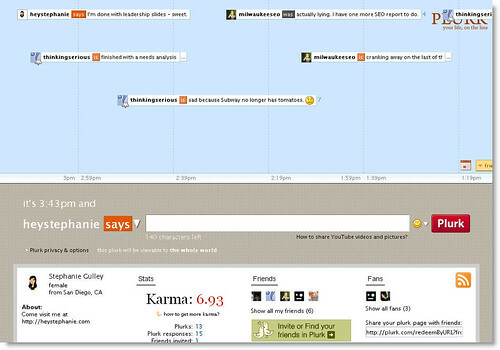 The only feature missing is the the horizontal timeline view which honestly isn’t a problem for me. 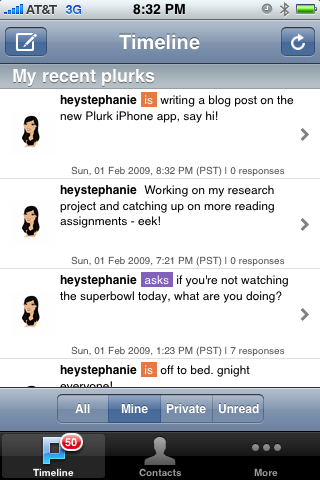 Interested in Plurk but don’t have an iPhone or iPod touch? No worries, you can access Plurk from their mobile site at http://www.plurk.com/m/login. It is also worth mentioning that you can use Plurk’s Google bot do interact with the site..
You can choose the people you want to get IM’ed when they plurk, plus any responses you get to your plurks. iPlurk app is pretty nice too, and in my experience a bit faster.